If there’s one man I can admit to loving just as much as Frank Camorra, it would be Andrew McConnell (sorry Chris). Barring Golden Fields, which was just ok, there has been no Andrew McConnell experience that hasn’t left me foaming at the mouth with delight. I had promised to treat myself to dinner at Cumulus Up once I finally found a job, so here we are! If you haven’t caught on by now, Cumulus Up is the little sibling to the Modern Australian magnate, Cumulus Inc. And yes, it is up from Cumulus Inc. 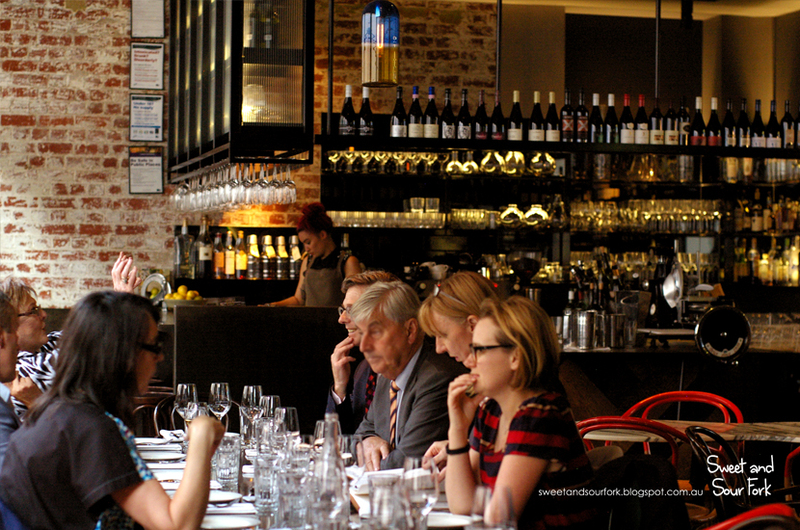 However, whereas Cumulus Inc. is airy and whitewashed, Cumulus Up is a European-styled wine bar buzzing with sophistication. 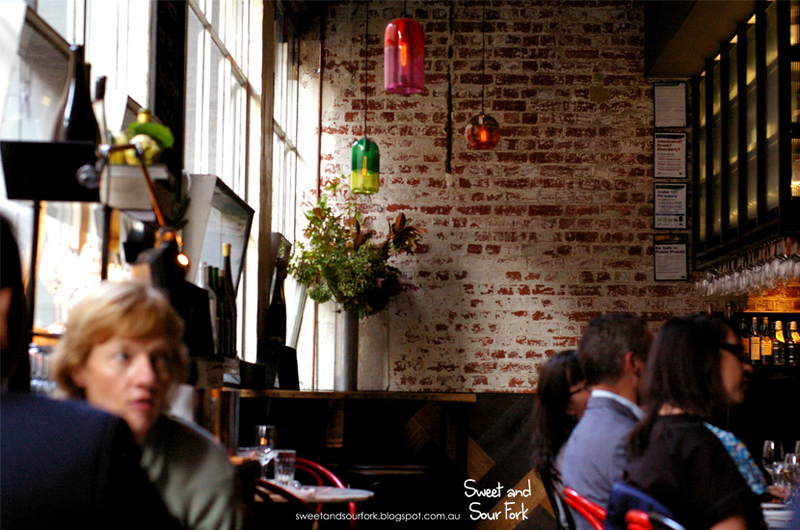 The ambience is dark and sensuous, the dining room decorated with ample amounts of exposed brick and rough-hewn wood, topped off with a glimmering bar. 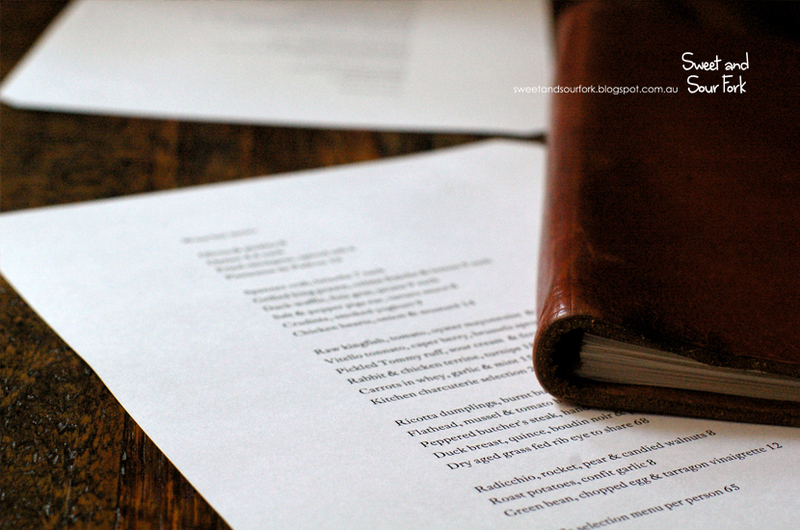 Though the menu was only one page long, it was more than made up for by the thick, leather-bound wine list. 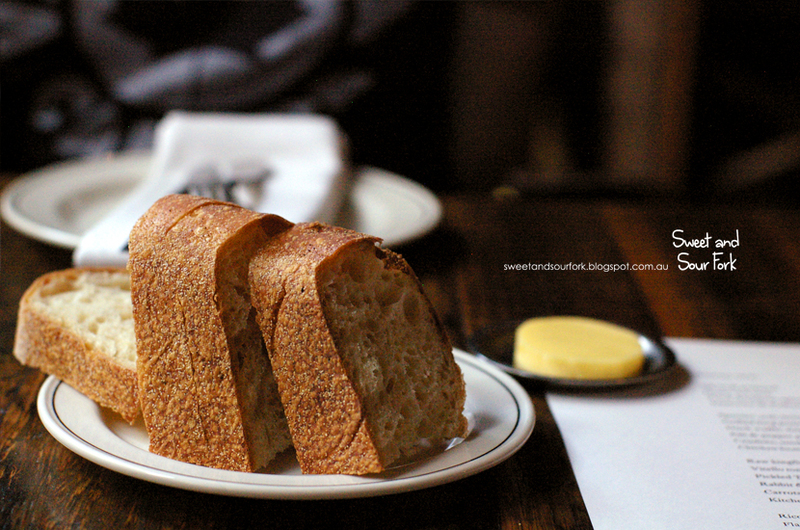 But as usual, we’re here for the food, and before long we had ordered, and started on our plate of Bread and Butter in the interim. The sourdough was thickly sliced, with a chewy crust and a moist, doughy centre. It was the butter however that really stood out with its creamy texture and organic, milky taste. 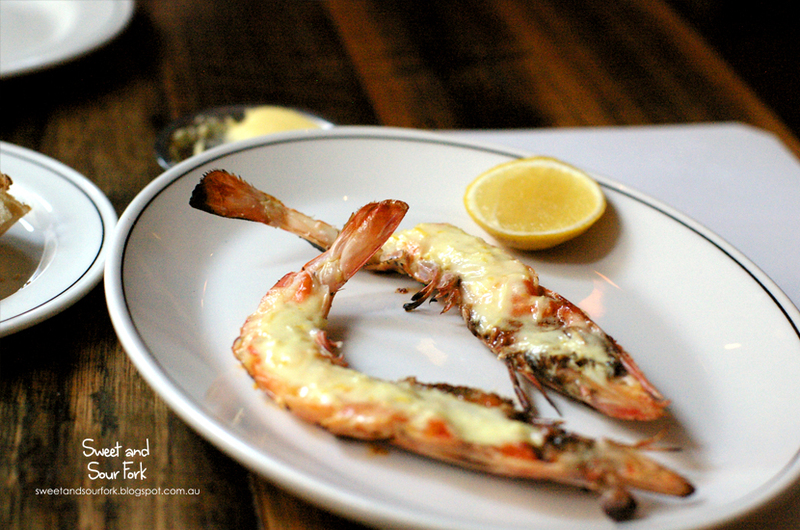 When I smelt the smoky aroma of the Grilled King Prawn, Crème Fraiche & Lemon ($9ea) at the next table, I knew I had to have it. The morsels of prawn inside the charred shell were sweet and succulent, the vividly briny flavours brought out by the creamy sauce and a squeeze of lemon. Though pricy (and fiddly! ), it was worth every cent. 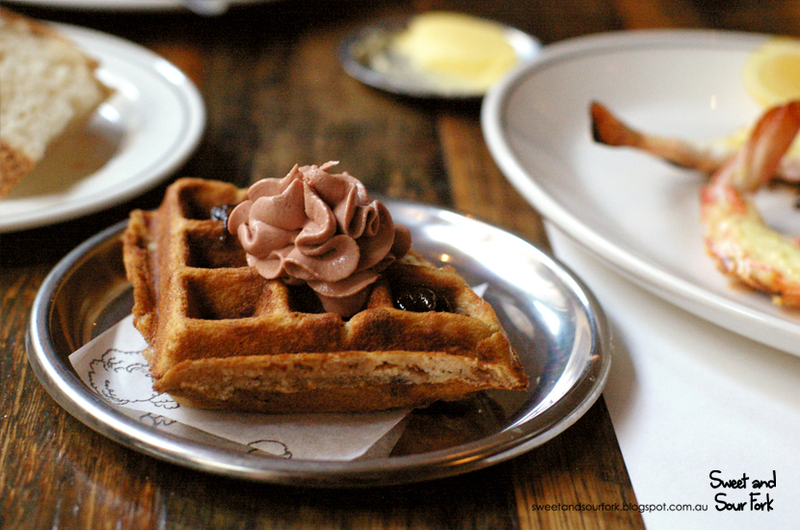 The Duck Waffle, Foie Gras, Prune ($9ea) is the signature dish at Cumulus Up, and there was nary a table without it. After spreading the rosette of foie gras into the waffle pockets and taking that first bite, the reason for its popularity becomes obvious. 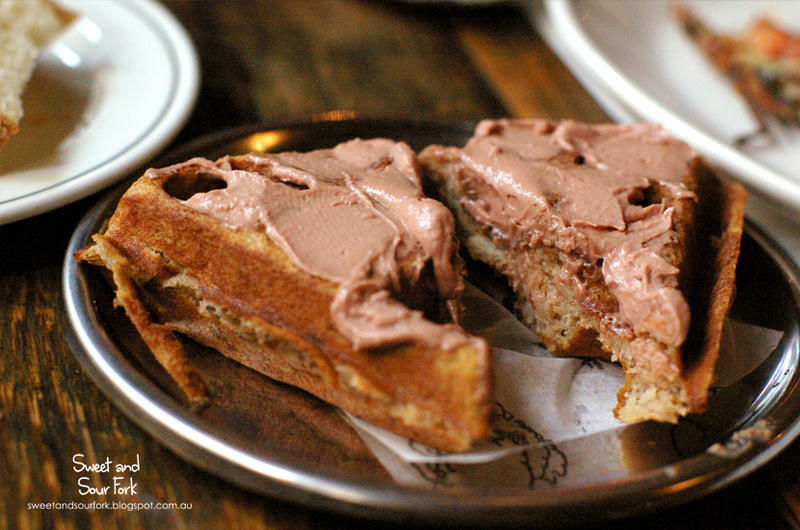 Biting through the crisp exterior of the waffle, we quickly discovered shreds of duck meat folded into the airy batter. Spread thickly with the ethereal foie gras and summery prune jam, I am happy to report that this is indeed the food of gods. If there’s one thing Andrew McConnell taught me, it’s that sashimi does not need to be confined to Japanese cuisine. 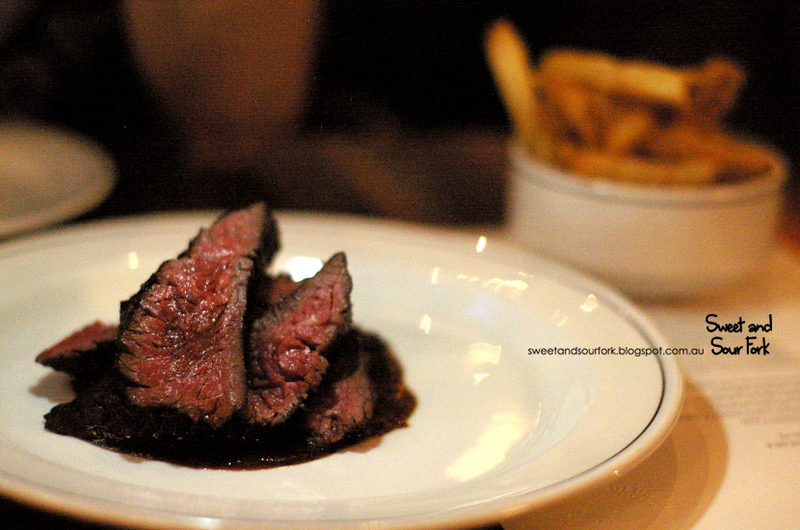 Especially if the result is as magnificent as one I had at Cutler and Co. So it was unsurprising that the Raw Kingfish, Tomato, Oyster Mayonnaise & Laver ($18) was a breathtaking work of art. 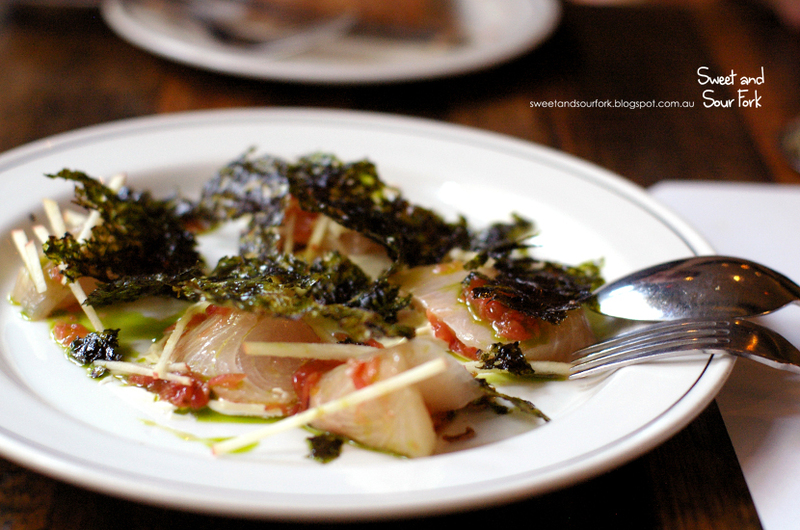 The plump slices of sashimi peeked through the gauzy roasted kelp, highlighted with daubs of macerated tomato and pale green dill oil. 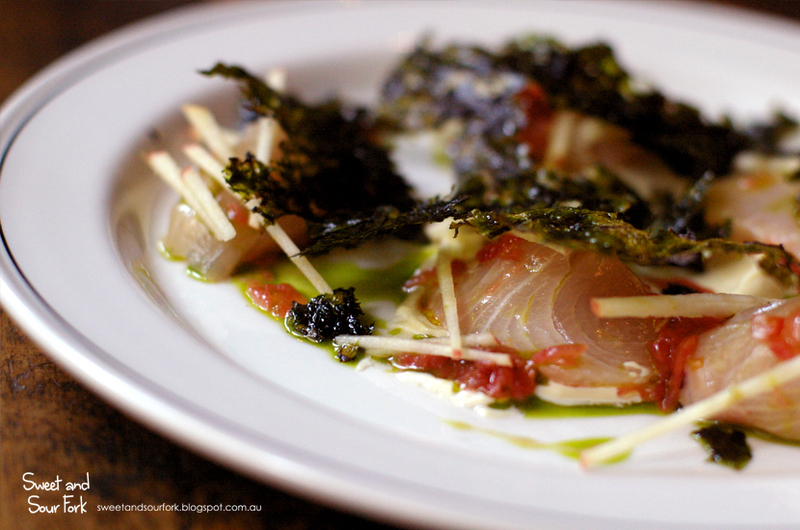 Despite the sheer intensity of the flavours, they matched the kingfish in daintiness. The thickly cut fish was adorned with the sweet citrus of apples and tomatoes, whilst the thick oyster mayo brought in another element from the ocean. It was topped off with the unexpected warmth from the brittle shards of kelp, forming a flavour palette that’s so vibrant yet harmonious that you really have to taste it to believe it. Coming back down to earth for the mains, we ordered the much simpler Peppered Butcher’s Steak, Hand-Cut Chips ($32) to share. Cut into 4 thick slices, each piece was deliciously pink with a salt-rubbed exterior, and then served with the most amazing pepper sauce. 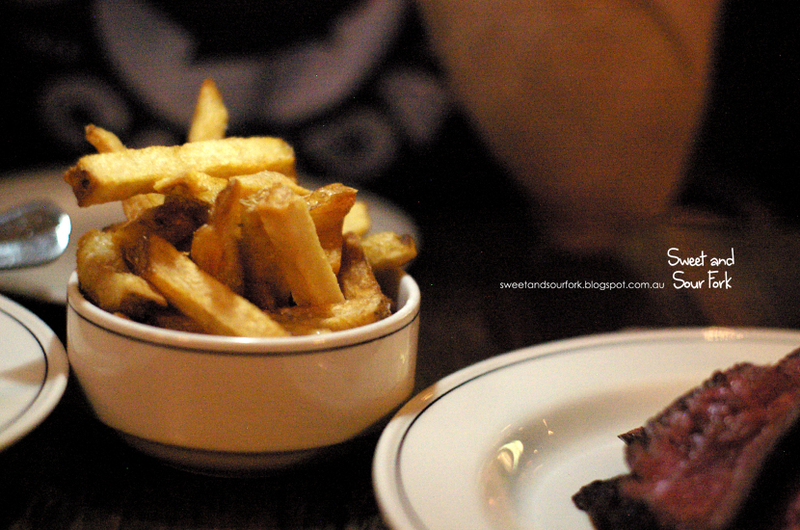 The hand-cut chips were equally as good; rustic and fluffy, with plenty of little crispy bits. 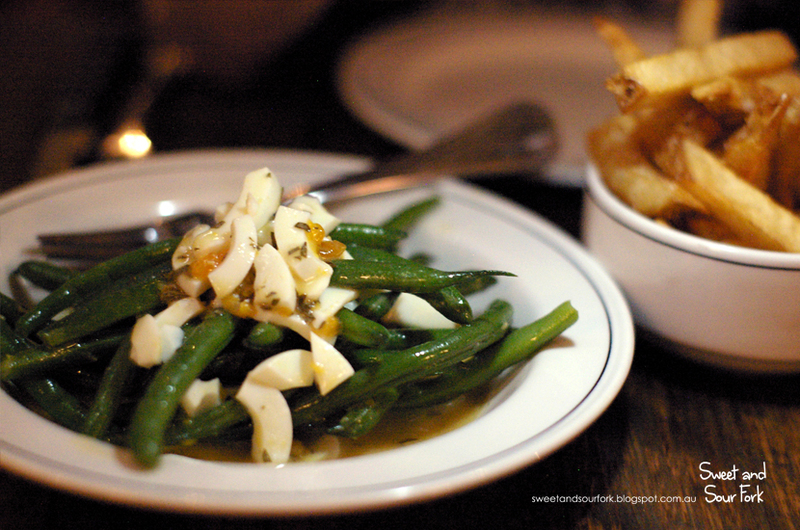 The obligatory greenery came in the form of Green Bean, Chopped Egg & Tarragon Vinaigrette ($12). The lush, crisp beans were flavoured with the contrasting creaminess of soft boiled eggs, and the sharp dressing. The result was a light yet balanced side dish that I had no trouble polishing up, even after all the steak was gone. It’s hard to write a conclusion when the restaurant is so unequivocally amazing; I suppose the service could be improved, as I felt the restaurant was a little short-staffed and the waiters very business-like. But whatever, average service really doesn’t bother me, not when the food is so stupendously good. Rating: 16.5/20 – in the clouds.